Its performance specs are going to blow your mind. Probably literally. Mate Rimac stunned the world (especially Richard Hammond) with his awesome fully-electric Rimac Concept One supercar. Introduced in 2013, it boasted 1,224 horsepower and the ability to hit 60 mph in 2.4 seconds. The technology in that car paved the way for the even more insane 1,914 hp C_Two, the car that Rimac launched last year and will be displaying on its stand at the Geneva Motor Show. Equipped with four electric motors and a 120 kWh battery, the C_Two is claimed to be able to travel 343 miles on one charge when using the WLTP standards. The claimed 0-60 mph time of 1.85 seconds and 11.8-second 0-186 mph time are no doubt made possible by the huge 1,696 lb-ft of instantaneous electric torque that the C_Two puts to the ground. But this new electric supercar is not just about brain-squishing acceleration, it is packed with technology developed in-house by the Rimac engineers. The carbon fiber monocoque is the biggest single carbon-piece in the industry and the first to integrate the battery into its structure, making the car extremely rigid and obviating the need for subframes as the suspension is attached directly to this carbon structure. The tech is impressive enough that Rimac technology is now used in most of the high-performance EV and HEV hypercars coming to the market. While designing, engineering and producing key electrification systems for the high-performance vehicles remains the mission of Rimac they are now supplying their battery and drivetrain systems, hardware, and software to many partners in the automotive industry. 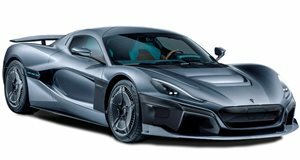 The C_Two meanwhile should be ready for production by 2020 and Rimac promises that the finished product will receive additional upgrades to push those mad performance figures even higher. The world is full of near production-ready electric hypercars, this one may well be the closest to reality.